I saw this recipe from Perrys' Plate on the menu over at Cassie Craves this week and thought it sounded delicious and nutritious! You could make them meatless too and they would be just as tasty. I love savory sweet potatoes and was surprised at how good the combination of their flavor with the taco meat and beans was. These are the healthiest "tacos" around :-)! Brown ground meat in a skillet over medium-high heat. Stir in taco seasoning, tomato sauce, and beans. Set aside. To assemble packets, spray the foil with non-stick spray. Place 1 cup sweet potato cubes in the center of each piece. Top with a small piece of butter (about 1 tsp) and a pinch or two of salt. 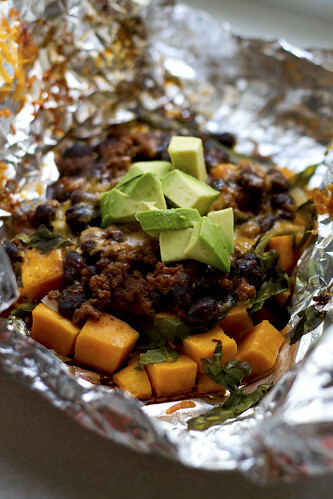 Sprinkle some chopped spinach over the sweet potatoes, followed by about 1/3 cup of taco meat and sprinkle of cheese. Fold the sides in, then bring the top and bottom ends of the foil together in the center and fold, sealing the packet. Repeat with remaining ingredients, placing the packets on a rimmed cookie sheet. Bake for 25-30 minutes until the sweet potatoes are tender. Serve with sour cream, salsa, and/or guacamole. I'm glad you enjoyed those "tacos"! I was surprised, too, how good they were with such simple ingredients. Love your photo, too -- turned out much better than mine!